When Thanksgiving rolls around and the whole family gets together, you can usually expect Jigsaw the serial killer to go on a long rant about how subjecting people to physical and psychological torture is the only way to test their will to live and determine whether they deserve to exist on Earth. We all know that those conversations usually just lead to fights and hurt feelings, so here are five tactful ways to shut down Jigsaw at Thanksgiving when he starts arguing in favor of sadistic death traps. 1. Refute Jigsaw’s argument with straightforward facts. Jigsaw never misses an opportunity to launch into a mid-dinner speech about how most people in this world are spoiled rotten and should be forced to fight for their lives so we can weed out the weak-willed. Thankfully, there’s an easy way to make Jigsaw realize that he doesn’t have the moral high ground on this one—come back at him with hard evidence. When Jigsaw starts talking about how the only people who deserve to live are the ones who are willing to saw off a pound of their own flesh and weigh it on a scale for him, you can say, “Actually, there are tons of people who are productive members of society but wouldn’t want to hack off their own flesh because doing so would hurt or because they need that flesh for things like driving and doing their jobs.” And...cue humiliated silence from Jigsaw! That’s when you drop the mic and go back to enjoying your turkey. When Jigsaw threatens to derail Thanksgiving by mouthing off about the importance of death traps, reminding him of your value system in no uncertain terms is a great way to make him realize that his argument isn’t going anywhere. Jigsaw will try to defend his death traps by saying things like, “My games are quite simple. Your fate is up to you—either you pass my test or you die.” Respond to him equally candidly: Take a deep breath and tell him as straightforwardly as you can that chaining people to walls full of rotating metal blades that they have to cut themselves on in order to save their own lives is just never going to be acceptable in your book. It’s called basic empathy, and it’s not something Jigsaw is going to be able to argue with. 3. Turn Jigsaw’s own logic against him by reminding him that anyone who spends all their time obsessing over vigilante torture schemes is probably not making the most of their own life. It can be infuriating when you’re trying to catch up with a cousin who traveled from out of state just to celebrate Thanksgiving with you and all of a sudden Jigsaw is trying to monopolize the entire conversation with an obnoxious tirade about how people who waste away their days on Earth hurting others and living idly should be willing to shed some of their blood in his carefully designed needle pit to prove their desire to stay alive. Fortunately, there’s a pretty big hole in Jigsaw’s logic that you can point out in order to stop his argument dead in its tracks. Look Jigsaw in the eye and ask, “If you care about how other people use their time so much, why do you spend every day building elaborate torture dungeons when you could be exercising, volunteering, or taking up a hobby?” Then, you and your cousin can get back to your conversation while Jigsaw is left sputtering in an attempt to justify all the effort he expends assembling his precious razor cages. Check and mate, Jigsaw. 4. Direct the conversation toward something you both have in common, like an interest in puzzles. As much as you might disagree with Jigsaw, there are certain things you have in common that you can use to your advantage. 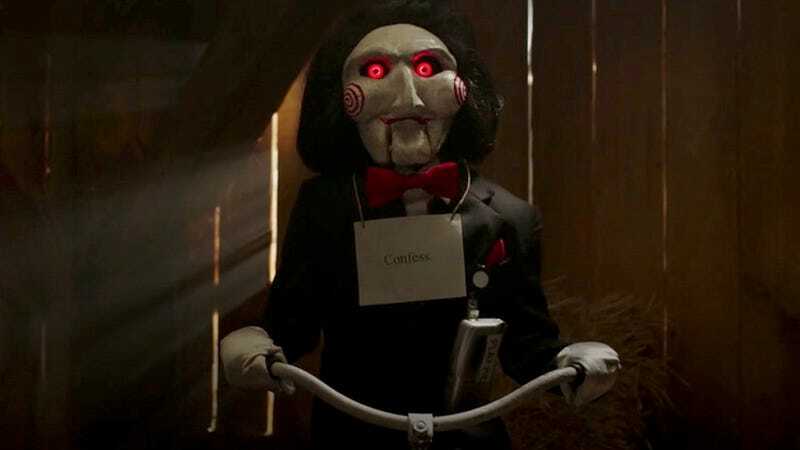 When Jigsaw starts describing how he wants to put a bunch of drug dealers in a room with a countdown clock and force them to choose one of them to sacrifice lest they all be killed, say something like, “That sounds like a really cool puzzle game. I am working on a fun sudoku puzzle—want to see it?” Now you’ve steered the conversation away from death traps, and even better, you and Jigsaw are connecting with each other. Because after all, you might abhor Jigsaw’s views on conducting his own torture-based penal system, but he’s still a human being just like you. 5. Be open to the possibility that you’re wrong about sadistic death traps. It’s never good to go into an argument with the hardheaded opinion that you are 100 percent right. Hearing Jigsaw out and agreeing with one of his points can be the ticket to getting out of a thorny conversation and even learning something about yourself. Consider the possibility that some people who have led easy, careless lives do deserve to be punished by Jigsaw—and tell Jigsaw that you appreciate his viewpoint. Then you and Jigsaw will be able to get back to enjoying Thanksgiving dinner together, and you’ll have a more balanced and nuanced opinion on death traps!